It was only last week when I had a few things on my mind that I wanted to make for the weekend. One of them was carne asada tacos, or carne asada fries, and the other was crispy potatoes for breakfast. Simple stuff, I know. As I had these great ideas of marinating the beef in tons of garlic and some lime juice, I will admit that time just got a away from me to some degree. As I was the first one up on Sunday morning, I decided to get my potatoes simmering on the stove. I will also admit that I promised my daughter that we would make French toast in the morning, and whenever that happens, she knows right away that she would wake up early and get started cooking with me. That was just the case. Moments after I woke up, she was right there, blurry eyed and all, asking if I was ready to make the French toast. That’s when I looked again at my potatoes and knew that I would have to get to them later. So about an hour later, after feeding four other hungry eaters, it was then my time to focus back on the potatoes. Obviously these were done and fork tender, but now it was around 10:00 a.m. and now I was having to take my daughter to Sunday school. This seems to happen quite a bit. Feed everyone, and then there is me. Oh well. So when I returned, that is when I saw the flank steak. Right then I knew I was going to make a steak and potato hash and indulge myself. Did I mention I love hash? That’s when I decided I would not only make this awesome hash, but I would use the small loaf of bread and make it into one of the better brunch sandwiches I have made in quite some time. This is not only a simple hash to make, but it is loaded with tons of flavor and is perfect in or out of a sandwich. Start by boiling your potatoes, and cook until just slightly under fork tender. During this time, season both sides of the beef with salt, pepper, and garlic powder. Set aside, and let it come to room temperature. Once the potatoes are about tender, strain and set them to the side. If you have a large cast iron pan (I think cast iron is best for making hash) use it. Bring your pan to medium high heat. Add in 1 tablespoon of the canola oil and swirl it in the pan. Lay in the beef and get a good sear on both sides, roughly 6 minutes per side. Once you have a great sear on both sides, remove the steak and let it rest on a cutting board. Now add the remaining oil and butter into the same skillet. Add in your potatoes, and onions, and cook for about 10 minutes, stirring along the way. Season with some more salt and pepper. During this time, slice your steak, against the grain. When the potatoes get that awesome caramelization, add in the steak, stir, and give it a taste. If it needs more salt, add a bit more to your liking. Remove the hash from the heat and set to the side to begin making your sandwich. Preheat your oven to 350 degrees. Lather both sides of your sliced bread with dijon mustard, then fit the Swiss cheese slices on both sides. Place into the preheated oven until the cheese is nice and melted. Once melted, remove from the oven and add the sliced chili peppers on the bottom layer. During this time, cook your egg to your liking. I like mine over easy, or sunny side up. Now it is time to build the sandwich. Take the bottom piece of your bread and generously layer on the steak and potato hash. Did I mention how hungry I was at this time? Add the egg onto the top, then add the top layer of the bread. Give a gentle press to add your built in egg dressing and dig in. This sandwich explodes in flavor. Just when you think you are getting a hash on a sandwich, you immediately get that great tanginess from the mustard, then the flavor from the Swiss, and then the hint of chili, along with the super tender steak and crispy potatoes! THIS SANDWICH WAS AMAZING AND IS ONE TO NOT BE RECKONED WITH. 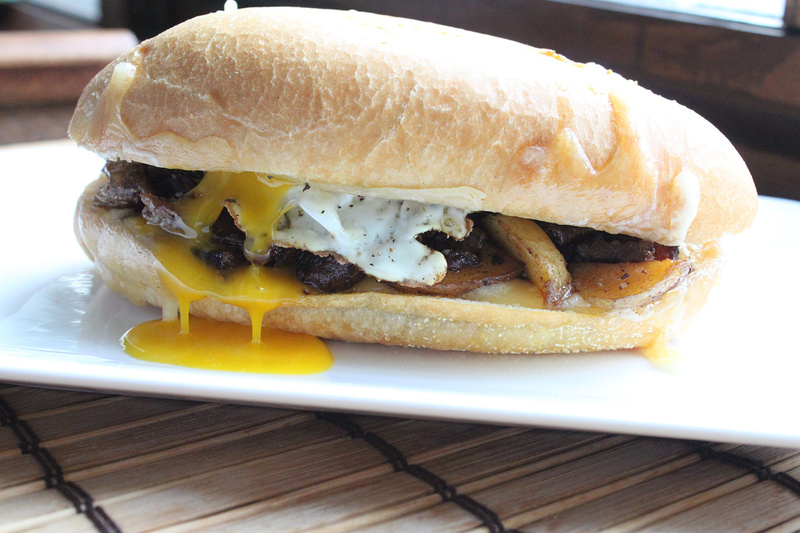 If you are looking for a great brunch sandwich, or hash at that, give this one a try. It’s a winner. Hope you enjoy!